Cinesite’s work on HBO’s Into the Storm was also nominated in the same category. The Emmy award marks the company’s second for visual effects, having previously been recognized in 2005 for the HBO miniseries Rome. Generation Kill is a seven-episode series based on the book by Evan Wright. It follows the First Marine Reconnaissance Battalion at the spearhead of the US invasion of Iraq in 2003. The action covers a one-month period up to and including the fall of Baghdad, with the story being told at ground level. Accepting the award were Cinesite VFX producers Courtney Vanderslice-Law, Paul Edwards, and Ken Dailey; CGI supervisor Stephane Paris; lead VFX David Sewell; lead VFX compositor Stuart Partridge; and lead CGI artist Jean-Paul Rovela. HBO’s VFX supervisor Adam McInnes and VFX producer Antony Bluff also received Emmys for their contributions. Cinesite’s work included the creation of convoys of photorealistic CGI military vehicles, missiles, burning oil fires, CGI attack aircraft, and the destruction of Iraqi cities. All of the visual effects were designed to be invisible, so as to not detract from the drama of the historic conflict being depicted. Fourteen types of CGI vehicles were created in all, each requiring modeling using accurate imagery and technical data, then complex texturing and animation. Procedural systems were written to create automatic vibration and suspension for the vehicles to give a realistic impression of vehicle weight and movement. To add further realism, tire tracks from vehicles traversing dusty and impressionable desert ground were added. Even the dust kicked up by the wheels of the numerous vehicles was created digitally. Several key visual effects shots show the scale of US military resources, including a sequence in the first episode that shows Camp Matilda. In one wide establishing shot, the environment is a 3D matte painting, with CGI tents created and replicated in the distance, and CGI vehicles and soldiers added. In another sequence, in episode two, the allies are shown advancing their Humvees towards Iraq in a massive convoy. 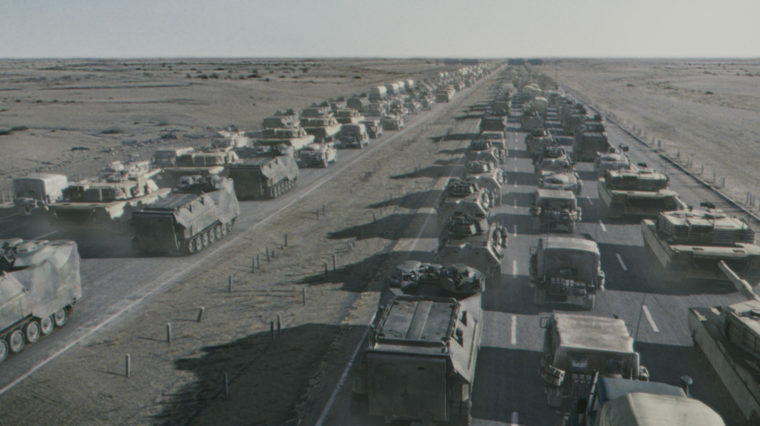 The Humvees travels across a road bridge and viewers see the soldiers’ view of a wide superhighway, with a multitude of CGI Light Armored Vehicles, tanks, Humvees and supply trucks. Cinesite overcame many challenges for his sequence of four shots, including digitally creating the environment.